Grim Fandango, is a game that game falls in the category of ‘I’ve heard of this but never played it’ for me. I remember seeing it back in the day on the 90’s TV show GamesMaster, and articles throughout the years wishing for a sequel or a port. As I didn’t own a PC and missed out on the genre, I didn’t have the chance to take a look at the game until 2004, thanks to mods and emulators that kept the game compatible with later hardware. 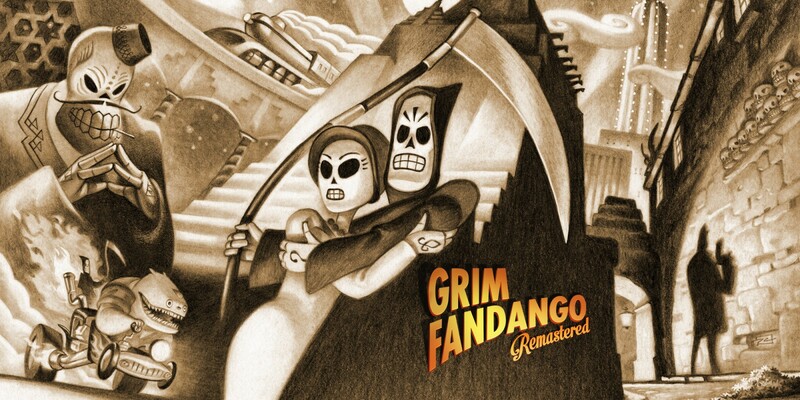 Anyhow, thanks to LucasArts being bought by Disney, and its change from a developer to a licensor, talks began with Disney to retain the rights, and subsequently this lead to the announcement of Grim Fandango coming to PS4, macOS, PC, and many more. During E3 this year, an announcement was made of it coming to the Nintendo Switch, with it being released earlier this month. As I hadn’t played it in years, it was a good opportunity to see how it fares since its original release in 1998. The game is set over four different acts, each being set on November 2nd, in the Land of the Dead. You play as Manuel “Manny” Calavera, voiced by Tony Plana, who has recently been seen in shows such as The Punisher, Lethal Weapon, and Ugly Betty. The environment is mainly a pre-rendered affair, so you’re walking through an animated-cartoon almost, while you check items and equipment to help you further the game. It reminds me of the first Resident Evil games with its pre-rendered look, alongside the tank controls, which, in 2018, can be very frustrating to control Manny with. One of the most iconic themes that is part of Grim Fandango, is the inventory screen. By pressing ‘X’, you can see the items being pulled out of Manny’s coat-pocket and him just casually commenting on his thoughts on it, especially when he tries to offer one of these when conversing with a character. Grim Fandango Remastered takes you across so many different locations, it makes you think if a sequel has ever been a possibility. You go from your office in the city, to a festival, a casino, a ship, submarine, a city on the edge of a waterfall, and so much more. Believe me, the story takes you into so many random avenues and directions along the way, you can’t help but just stick around and see where it takes you. Another aspect of this genre, is the fact that you can choose between multiple questions and answers when you interact with the world. I found myself talking to so many with random answers, that I lost an afternoon to it. I only achieved what seems like 1% further along the game looking back! An advantage of this remaster, is that you can change the aspect ratio of the display, or have it rendered to the original or remastered graphics. In all honesty, I didn’t notice much of a change between this particular setting. It’s still rendered the same way from the same engine when it comes down to it, and so it only looked like a few extra shaders have been added to some rooms for added effect. But apart from the graphics, the most notable difference are the newly-recorded sounds, where you hear it in all its orchestral glory, compared to the ‘MIDI’ sounds of 1998. This isn’t fully appreciated until you either plug in some earphones in handheld mode or have it docked and turn up the volume on your television. It’s a nice change, and it makes the world seem even more alive, as corny as that reads. Alongside viewing cut-scenes, concept art, and the credits as well, there’s also a Director’s Commentary, where you can listen as you play. This gives great insight into the game twenty years on and even makes you feel appreciation towards the developers. You can tell how much they have the game in high esteem, and how much they enjoyed creating it. Of course, with it being a remastered game, it doesn’t come without its faults. For a gamer in 2018, there’s next to no hints as to where you need to go next, or to back-track to, and this could put some people off from playing further. ‘Hints’ throughout the game may have helped, but alas, you’re on your own unless you use the YouTube app to find a guide for it. The tank controls, although slightly better than Resident Evil, are still tank controls. It feels incredibly outdated and heavy when you use the Joy-Con or an external controller. You can indeed use the touch-screen in handheld mode instead to direct Manny, but when in docked mode, you’re out of luck. Then again, with it being the Switch, you can play this wherever you want, so I can see this mostly being played on a long-commute, losing yourself in the game and its rich-world. Overall, it’s a fun game that requires patience, but the reward you get is a world packed full of funny, interesting characters, where they turn the subject of ‘death’ on its head and makes you laugh about it, thinking that it’s just another part of life, rather than the ultimate end. It’s a journey, and as a game, it should all be treated as such, but it can’t hurt to enjoy the path between the start and the end, and that, to me, is what Grim Fandango is all about!